For a director usually associated with family dramas like I Wish, Like Father Like Son and After The Storm, Hirokazu Kore-eda’s The Third Murder might seem like a change of direction. It begins with a murder, and focussed on a lawyer trying to uncover what actually happened, a narrative template familiar from countless films about journalists in search of a story, detectives trying to solve crimes and courtroom dramas of lawyers at work. Yet there are plenty of Kore-eda concerns evident here. Ambitious young lawyer Shigemori (Masaharu Fukuyama from Like Father Like Son and John Woo’s thriller ManHunt) is a workaholic estranged from his wife. His daughter commits petty offences like shoplifting. His client Misumi (Koji Yakusho) was imprisoned for a murder over thirty years ago, but since his release has confessed to a second murder. He, too, has a daughter, but she wants nothing to do with him. The opening scene, in deserted marshland at night, at first seems cut-and-dried. Misumi hits his boss over the head with an industrial spanner, then burns the body. But did he actually do what we just saw or was it a fabrication? Misumi’s legal defence team are stumped by their client’s tendency to keep changing his story. Out of their depth, the firm hires Shigemori to represent Misumi in court. Only then does Kore-eda flummox the audience by delivering unexpected, conflicting images in which Sakie is the murderer. This recalls the famous multiple perspectives of Akira Kurosawa’s Rashomon, but also includes shots that continue to implicate Misumi in the murder. Did Misumi and Sakie do it together? Are we seeing what she imagines, or what she really did, or speculation on Shigemori’s part? To confuse perceptions still further, Sakie claims that the limp she’s supposed to have had since birth was actually caused by a childhood accident, turning her into a possibly unreliable narrator. The story’s courtroom drama aspect makes The Third Murder unusual in Japan. In a helpful half-hour talk to camera, presented here as one of the disc extras, Tony Rayns points out that Japan’s court system didn’t have juries between their abolition during World War Two and their reinstatement in 2009. Consequently, there’s never been a Japanese drama like Hollywood’s Twelve Angry Men in which one member of a jury must convince the other eleven of a man’s innocence. By way of contrast, although a large section of The Third Murder takes place within the context of a Japanese jury trial, the jury serves no real function in the plot. It’s all about the lawyer and the suspect. The disc’s second, equally worthwhile extra is an informative documentary in which we see Kore-eda rehearse an early draft of his script with real life lawyers playing judge, lawyers and subject in order to make his script believable. He also claims that whereas in many of his films he knew what he was doing in terms of how the final film would play out, in this one he was working the whole thing out as he went along via some two hundred or so different versions of the script, among them rewrites when working on set with cameras and actors. While it’s true that Kore-eda has a reputation for amending scripts as he goes along, that process would appear to have been far more extreme in the case of this particular film. Also featuring prominently in the narrative are exchanges between killer and lawyer through the glass of a prison interview room reminiscent of Manhunter (1986) and The Silence Of The Lambs (1981), but whereas the scenes in those films (and in the Thomas Harris novels on which they are based) are a means to build up the killer’s dark and frightening persona, Kore-eda’s intentions are very different: his interest lies in showing a suspect whose account of what actually happened shifts from day to day. Thus two-thirds of the way into the film, while the court case is actually in progress, Misumi suddenly about faces to say he didn’t actually commit the crime, throwing his legal representatives into disarray. The victim, dead at the start, barely gets a look in. Kore-eda is more interested in the lawyers’ conversations with the killer and others along with the family backgrounds of killer, lawyer and victim. As well as exchanges between killer and lawyer, the film also sits in on conversations between not only the members of the defence lawyers’ team but also the defence, the prosecution and the judge. 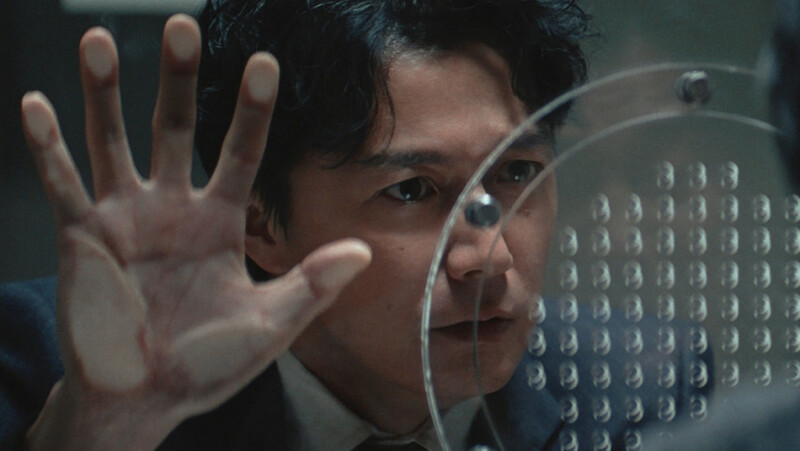 In the end the overall narrative plays out less like a courtroom drama and more like an essay on the nature of truth as Shigemori and team attempt to sift through the often conflicting evidence. The legal firm want to obtain the best judgement for their client while Shigemori wants to discover the truth, a very different and possibly conflicting aim. Truth becomes a murky quantity at best. It might even be that the titular third murder is that of truth in the hands of lawyers. The Third Murder is released on dual format Blu-ray and DVD on 23rd July 2018.